TWO rounds down and for some teams wins are becoming important in a nine-game season, with the ladder already starting to take some shape. 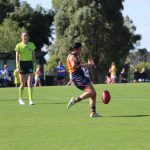 Just Geelong Falcons and Calder Cannons remain undefeated in season 2019, while Northern Knights and Oakleigh Chargers have collected six of a possible eight points so far this year. For Sandringham Dragons, Gippsland Power and Western Jets, it is an opportunity to grab their first points of the year. Some teams have made multiple changes with Futures Games occuring either side of their respective Under 18s games, meaning those future stars are able to play in either team, with some only eligible for the Futures sides. 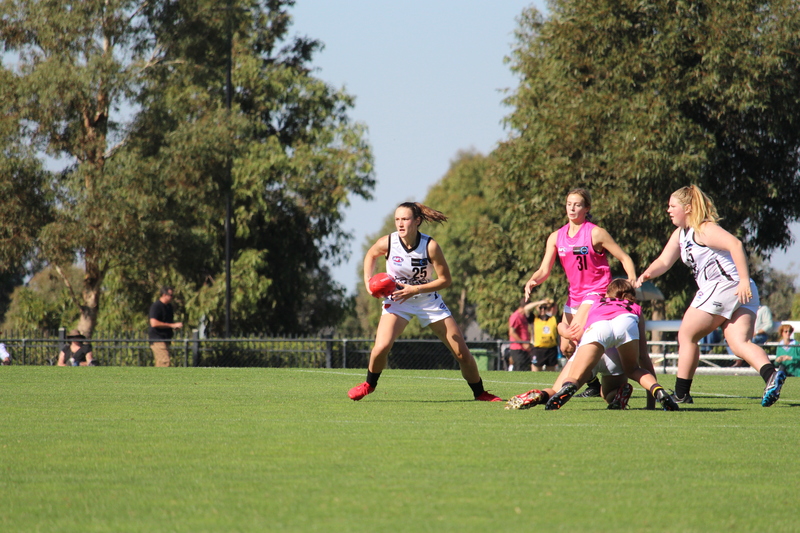 Among the big inclusions for the NAB League Girls Under 18s are Western Jets’ key defender Isabelle Pritchard who returns to centre-half back, GWV Rebels’ Nyakoat Dojiok and Isabella Simmons who impressed up either end and running through the midfield in Round 1. The round kicks off bright and early with Sandringham Dragons and Calder Cannons going head-to-head at Trevor Barker Beach Oval. THE Greater Western Victoria (GWV) Rebels had a solid season in 2018, finishing fifth overall with six wins from nine games. 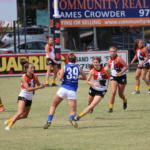 They had a tough start to the season with fixuring, going down to top four sides, Eastern Ranges, Geelong Falcons and Northern Knights in the opening four rounds. A few single-digit wins followed and the Rebels built confidence as the season went on, recording good wins against Gippsland Power and Oakleigh Chargers in the final fortnight. Georgia Clarke – Won the GWV Rebels best and fairest for a reason. Clarke was one of, if not the standout defender in the competition this season. Ever consistent, Clarke was strong one-on-one and positioned herself well in the back half. She rebounded out of defence regularly, stopping opposition attacks in their tracks. She was trialled up forward in the first game early on, but went to defence and never looked back. The clear standout from the Rebels in season 2018. Sophie Molan – Still a bottom-ager, but the versatile midfielder was one of the Rebels most consistent, particularly standing up early in the season when the Rebels needed someone. She moves well, finds plenty of the ball and can play any role from midfield to forward or back. A player with plenty of potential, and one to watch next season as she still has 2019 to develop further. Sophie Van De Heuvel – Rotated between midfield and forward, Van De Heuvel was one of the better users by foot in the competition. While she does not win a truckload of the ball like other midfielders, she rarely wastes a disposal and is also able to kick long distances, helping her with set shots for goal. 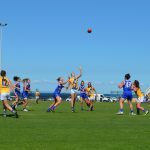 No doubt she will get plenty of VFL Women’s action for Williamstown this season. Lauren Butler – The Rebels captain was another player who was consistently in the bests and always put in a four-quarter effort. She played through the midfield but could play forward or back, and often had roles to nullify opposition stars, or try and hurt them with her consistent effort. Denver Henson – Playing through the midfield including ruck or roving, Henson was a solid link in the chain through transition from half-back to half-forward. She moved well for a taller player and was often underrated for the impact she had in the contest, but was valuable to the side, putting her body on the line. Renee Saulitis – Smart small forward who made the Under 16s Vic Country side and one to watch out for in future years. Managed to kick a few miraculous goals from tight angles, and used her speed to burn off opponents or pounce on loose balls from a marking contest. Nyakoat Dojiok – Had a consistent season on the wing and rotating through the flanks. She has speed, great agility, and clearly raw talent that will help her with the bottom-ager having plenty left to work on, but having a good core to work with going forward. Rene Caris – Did not play a full season given a pre-season injury, but impressed when she came into the side. Still raw as most talls are, she is mobile and can play in any key position, but ruck seems to be her most preferred. Smart with the way she taps to her midfielders. 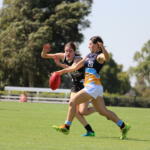 The GWV Rebels were considered one of the better teams coming into 2018, with the three AFLW Academy members and a number of bottom-age and 16 year-old talent. Led by Butler and having the rock in defence in Clarke, the Rebels overcame early losses against top sides, to finish about where they would have expected, competitive with every side, and notching up plenty more wins than losses. FIFTY players from across the TAC Cup Girls’ competition have been named in AFL Draft Central’s Team of the Year squad, with the even cut-off those who received two of more nominations in our Team of the Week. There have also been 43 players recognised by AFL Draft Central who put in an outstanding effort to be nominated once throughout the season. Remarkably, there has been an almost even split, with 26 players receiving three or more nominations in our Team of the Week, while another 24 players made the team twice. Of the 50-player squad, Geelong Falcons received the most nominations with seven players receiving two or more nominations in the Team of the Week, while the Northern Knights (six) were next followed by Sandringham Dragons and Eastern Ranges (five each). It is no surprise that these four teams were the top four sides at the end of the TAC Cup Girls regular season. It was an even split between the next five sides with Dandenong Stingrays, Greater Western Victoria (GWV) Rebels, Murray Bushrangers, Oakleigh Chargers and Western Jets all having four dual nominees, while Gippsland Power had three. Bendigo Pioneers and Calder Cannons had the two standout players each who were nominated multiple times. In terms of total players nominated, the Geelong Falcons and Eastern Ranges both had an impressive 11 players nominated at least once, ahead of Northern Knights and Sandringham Dragons (10), Dandenong Stingrays and Murray Bushrangers (nine), Oakleigh Chargers (eight). GWV Rebels (seven), Western Jets (six), Bendigo Pioneers (five), Gippsland Power and Calder Cannons (three) to round out the 12 sides. In terms of most nominations, it is no surprise to see Calder Cannons’ Madison Prespakis and Gippsland Power’s Tyla Hanks, are leading the way with a stunning eight nominations from eight games. The pair will be captain and vice-captain in the Team of the Year. Just as remarkably, 15 year-old Ellie McKenzie is outright third, with six nominations from her six games and will no doubt feature many times in the team over the next two years. The final AFL Draft Central TAC Cup Girls Team of the Year will be posted later in the week.